Media captionGeorge Osborne said complaints from Labour politicians about the agreement were "a bit rich"
An agreement for US firm Google to pay £130m in UK back taxes has been labelled as "derisory" and a "sweetheart deal" by critics. The payment covers money owed since 2005 and follows a six-year inquiry by Her Majesty's Revenue and Customs. George Osborne hailed it as "a victory" for the government, but Labour's John McDonnell said the sums were "trivial". Meg Hillier, chair of the Commons Public Accounts Committee, said it was "a small amount of money" for Google. The tax agreement comes after years of criticism of Google and other multinational firms over their tax arrangement in the UK and across Europe. Mr Osborne told the BBC the agreement was "a real vindication of this government's approach", but he added that details of the deal were "confidential". "These are taxes paid on profits when there was a Labour government," the chancellor said. "Not a single penny was collected and now to have Labour politicians complaining about it is a bit rich." However, speaking to BBC Radio 4's Today programme, Labour's Mr McDonnell called for greater transparency, saying it looked like a "sweetheart deal". "HMRC seems to have settled for a relatively small amount in comparison with the overall profits that are made by the company in this country. And some of the independent analysts have argued that it should be at least 10 times this amount," he said. Mr McDonnell said he would raise the issue in Parliament next week and called for the deal to be investigated by the public spending watchdog. "It looks to me from all the independent analysis that this is relatively trivial in comparison with what should have been paid. In fact one analysis has put the rate down to about 3%, which I think is derisory," he added. Starbucks, which runs 843 coffee shops in the UK, came under fire after it was revealed the company paid £8.6m in corporation tax in its 14 years of trading in Britain, despite sales worth billions of pounds. In 2014 it paid more than £8m in tax on the back of record profits of £34.2m. Facebook paid £4,327 ($6,643) in corporation tax in 2014, according to its latest UK results. It showed the company as making a pre-tax loss of £28.5m last year, but the firm also paid its 362 UK staff a total of £35.4m in share bonuses. It means Facebook's UK corporation tax bill was less than the tax the average UK employee paid on their salary. Amazon attracted anger after it emerged that the UK arm of the business paid £11.9m in tax in 2014, despite taking £5.3bn in sales from British shoppers. Conservative MP Mark Garnier, a member of the Treasury select committee, said the agreement represented a "relatively small" amount of money compared with Google's UK profits. Richard Murphy, from the independent Tax Justice Network, estimated Google should be paying £200m every year in Corporation Tax. He said the figure was based on the firm's declared profit margins and sales in Britain in 2014 of £4.5bn. The Tax Justice Network, which has been the scourge of creative tax arrangements, says Google should ordinarily be paying more than £200m every year - rather than £130m for a decade in back taxes. By using Google's own declared profit margins of around 25%, it would appear as if the technology giant could be paying more Corporation Tax in Britain on its £4.6bn annual sales. We don't know exactly how much profit Google makes here every year before the tax creativity kicks in. But Google also knows it doesn't live in a vacuum, despite its near monopoly on internet and mobile search. So there are many people who believe that this additional £130m is pre-emptive. Google knows that the Diverted Profits Tax (known as the "Google Tax") which came into force last year will mean it will have to pay more to HMRC. On top of that, the OECD has come up with much stricter international rules for 'Base Erosion and Profit Shifting' or aggressive tax avoidance. Taxes on profits should soon be paid where the economic activity takes place rather than where the company is domiciled. So if you sell internet adverts or frothy coffee in Britain, you can't book the sale in Dublin, Amsterdam or the British Virgin Islands. Labour MP Ms Hillier labelled the agreement a "cosy deal", saying she would call Google and HMRC before the Public Accounts Committee to explain the deal. The deal showed HMRC had admitted collecting "too little tax from Google for nine out of 10 years", she added. Margaret Hodge, the Labour MP and former chair of the same committee, said HMRC had "a duty" to explain details of the agreement. The government needed to "assure us that everyone is treated fairly before the law and confidence in tax system is restored", she added. 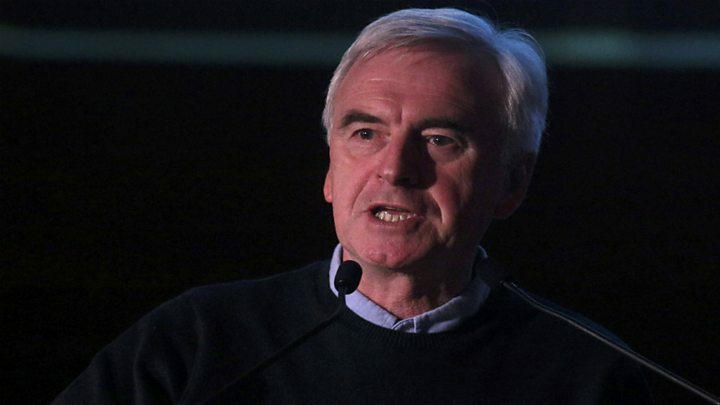 Media captionShadow chancellor John McDonnell says HMRC tax deal is "relatively trivial" for Google. Google paid £20.4m in UK taxes in 2013. The value of its British sales that year was £3.8bn. Google makes most of its UK profits through online advertising. In March's Budget, Mr Osborne announced the introduction of a so-called "Google tax" targeting firms that move their profits overseas. Google has its European headquarters in the Irish Republic, which has a lower corporation tax rate than the UK. It has also used company structures in Bermuda, where the corporation tax rate is zero, to shelter profits. Such moves are legal and Google - a US business, which pays the majority of its taxes there - says it has abided by international tax rules. The agreement with HMRC will also see Google start to pay tax "based on revenue from UK-based advertisers, which reflects the size and scope of our UK business", the US online search firm added. Matt Brittin, head of Google Europe, told the BBC: "Today we announced that we are going to be paying more tax in the UK. "The rules are changing internationally and the UK government is taking the lead in applying those rules so we'll be changing what we are doing here. We want to ensure that we pay the right amount of tax." An HMRC spokesman said: "The successful conclusion of HMRC enquiries has secured a substantial result, which means that Google will pay the full tax due in law on profits that belong in the UK. "Multinational companies must pay the tax that is due and we do not accept less." Who wins from Google tax?